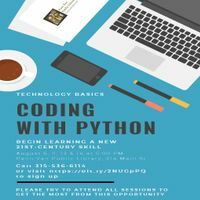 Interested in learning to code? This is the place to start! Computer science scholar Drew Harper will get you grounded in the basics of Python, one of the most versatile and in-demand programming languages. Call us at 315-536-6114 or visit https://bit.ly/2NUGpPQ to sign up; participants are strongly encouraged to attend each session to get the most out of the experience. Free and open to all. **Note** This class meets 4 times: August 6, 7, 13, and 14. It may be expressed differently on this calendar due to its limited date input options.